Don’t down tools just yet fellow gardeners, there are still more seeds to plant, still more to harvest, still more to store. Plant another batch of lettuce and rocket, plant radishes and chard. This is still a good time for germinating, but watch out for the slugs as when it is wet they hide under the leaves of your vegetables. If you feel that the nights are getting a little cold by all means use a poly tunnel this will definitely prolong the season. Pick off any caterpillars that are lurking underneath your cabbage or broccoli leaves, I find it easier and more successful doing this by hand rather than by using some kind of spray, it doesn’t take that long either. 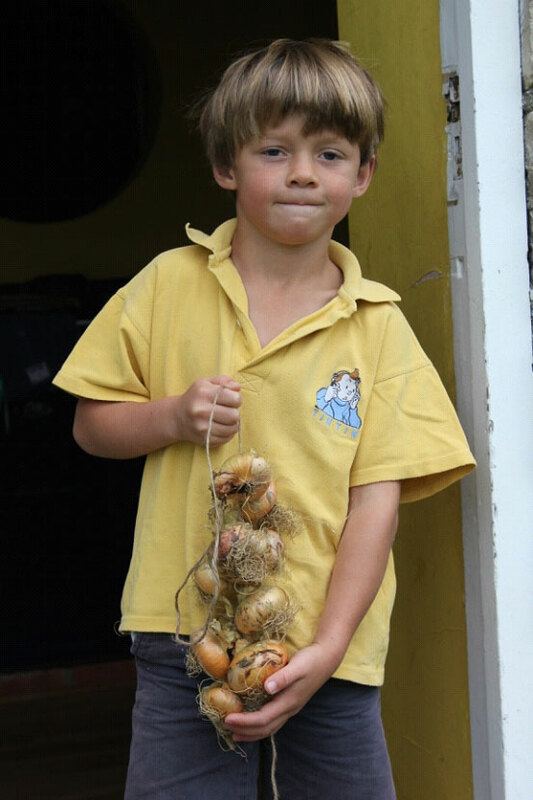 I have pulled up all of my onions and garlic, they have been drying nicely in the sun and now my six year old son and I have tied them into wonderfully French bunches – We feel very professional! You do this by getting a piece of twine about 1m in length, then tie on each onion individually. Make sure that the neck of the onion is tied off tightly, this will keep the onion moist, and help it to last. At the moment I am harvesting courgettes, lettuce, rocket, tomatoes, basil, climbing French beans, runner beans, potatoes, raspberries, plums and a few apples. This entry was posted in Grandpa Haxnicks and tagged Easy Poly Tunnels on 18th August, 2011 by Haxnicks.